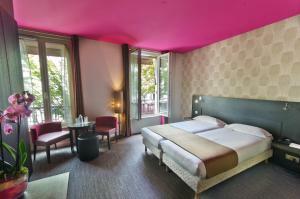 Hotel Aero is located in the heart of Paris 1.5 km from the Eiffel Tower and Trocadero. Quai Branly Museum is 1.8 km away. Aéro offers guestrooms with a flat-screen cable TV with English channels, free WiFi access and air-conditioning. They all have a private bathroom with a shower or a bath, free toiletries and a hairdryer. Breakfast is served daily in the hotel’s dining area. All rooms are serviced by a lift and room service is available until 22:00. The famous rue de Passy and its Luxury shops are within walking distance from the hotel. This air-conditioned room features a flat-screen TV with satellite channels and a safety deposit box. The en suite bathroom includes a hairdryer and free toiletries. Rate: € 85.00 ... € 230.00; select dates below to get current rates. Rate: € 151.43 ... € 212.31; select dates below to get current rates. Rate: € 181.76 ... € 212.50; select dates below to get current rates.